There is a lot of gratification in being a teacher, but it can be expensive as well. In obtaining their own education most aspiring teachers rely on financial aid or scholarships to help pay their way. If those sources are not sufficient, many turn to student loans to cover the rest of their expenses. Upon graduation, they are often faced with the difficult task of trying to find a job where they can earn enough money to repay these loans. This often dissuades energetic young teachers from applying to low-income schools districts which might be most in need of their services. To counter this, both the federal government and some states have developed programs which encourage teachers to work in certain areas. Arkansas is one of these states. The federal government offers two types of loan forgiveness programs for teachers: teacher loan forgiveness and teacher cancellation for Federal Perkins Loans. Under the loan forgiveness program, you may be eligible for forgiveness of up to a combined total of $17,500 on your Direct Student Loans and your Subsidized and Federal Stafford Loans if you teach full-time for five complete and consecutive academic years in certain elementary and secondary schools and educational service agencies that serve low-income families, and meet other qualifications. If you have a loan from the Federal Perkins Loan Program you might also be eligible for loan cancellation of up to 100 percent for full-time teaching at a low-income school, or for teaching in certain subject areas. Arkansas State Teacher Education Program (STEP): This is a loan repayment program. STEP offers yearly grants intended to repay student loans to current educators in public schools in designated geographical areas or in certain subjects considered to be short on teachers and administrators. The list of schools where educators are eligible to receive these grants changes from year to year, as does the list of subjects. Math and foreign language commonly appear on the list of subjects eligible for this program. Educators who graduated college after April 1, 2004, and who have been Arkansas residents for at least 12 months are eligible to apply for the grants, which can total up to $4,000 per year and are paid directly to the student loan lender. 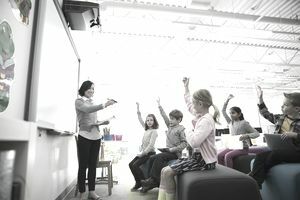 Licensed teachers can receive $3,000 per year for teaching in a geographic area with a "critical" shortage of teachers, or for teaching a subject considered to have a "critical" shortage of teachers. Licensed teachers who are members of a minority can receive an additional $1,000 per year in loan forgiveness for teaching in shortage areas or subjects. Teachers can receive three years' worth of grants and must reapply every year. The annual application deadline for the program is June 1. Arkansas Teacher Opportunity Program (TOP): This program offers reimbursement for continuing education. TOP is designed to help current Arkansas teachers and administrators further their own educations. Eligibility is open to teachers and administrators who have been residents of Arkansas for 12 months, those who are teaching in Arkansas schools and declare their intention to continue such employment in Arkansas, and are enrolled in an approved institution of higher education in Arkansas in a college level course(s) directly related to their employment. Qualified teachers can apply to be reimbursed for out-of-pocket expenses for up to six credit hours, or $3,000. Tuition, mandatory college fees, books, and required supplies all are reimbursable expenses. If funds in the program run short, the Arkansas Department of Higher Education will give priority to teachers who are taking classes in subject areas that currently are experiencing a shortage of teachers in the state. Teachers must have at least a 2.5-grade point average in the classes reimbursed by the state. The annual application deadline for the program is June 1.